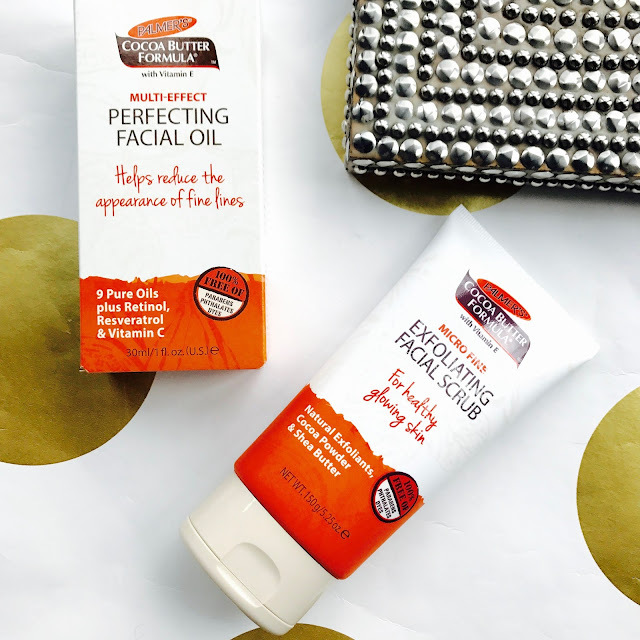 So this week I bring to you a review of some of Palmer's fabulous face products. When I think of Palmer's the first thing that comes to mind is definitely their Cocoa Butter Formula. Their Cocoa Butter Body Lotion is something I have used for years and I don't know why it didn't occur to me that they might do other great products too. 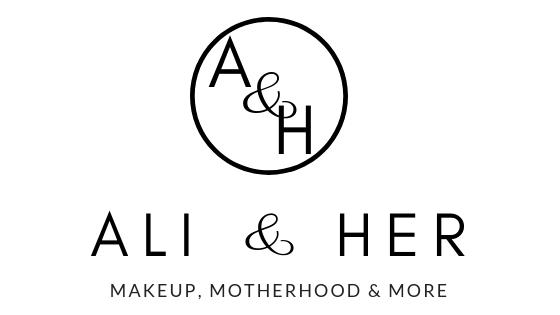 So when I was contacted to review some of their other skincare I literally jumped at the opportunity. 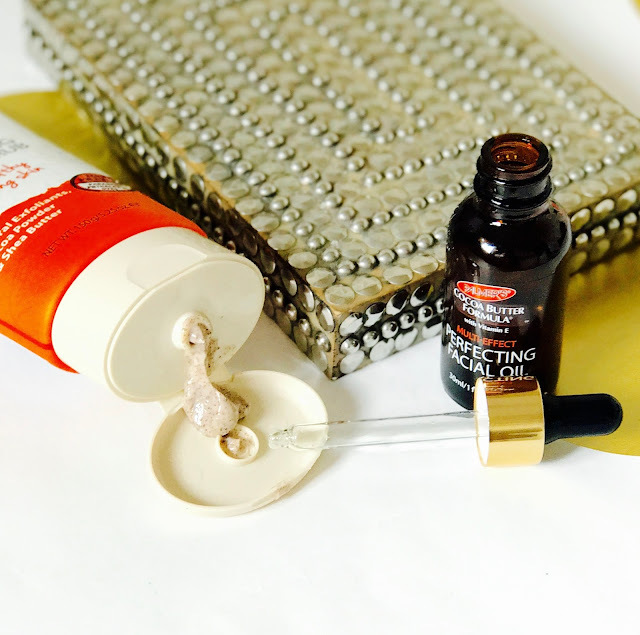 I love facial oils and if you follow my blog you will know that I love my St Ives Invigorating Exfoliator, so I was intrigued to see if this could compete. I have been using the Multi-Effect Perfecting Facial Oil and Micro Fine Exfoliating Facial Scrub for a few weeks now. First with the Facial oil, I started off applying it twice a day, morning and night and added it to my skincare routine quite comfortably. However I did find my skin feeling a little too greasy, so I gradually found myself reducing it to once daily at night, as this way my skin could continue to absorb it while I sleep. The facial oil comes in a dropper style bottle which makes it really easy to apply straight to the face or drop into the hands. Once applied, I simply massage into the skin. Straight away you feel a suppleness to the skin and your skin is left with a healthy glow. What I have found with continued use it that my skin definitely feels more plump and hydrated. Some deep lines I have in my forehead have also become less visible. This really fascinated me and encouraged me to look at the ingredients. What I found was some great key ingredients such as Retinol, which increases cell turnover, Vitamin C, which brightens the skin, and Vitamin E, which is great for scarring and Squalene which helps with surface hydration. The fact that you get all these fab ingredients and more all for £9.99 makes it a winner for me. I also love that it doesn't give you that horrible oil smell that some other facial oils have and, occasionally, when I want a really natural but dewy look, I wear this in the day and the natural highlight it gives my cheekbones is the BEST! Now for the Micro Fine Exfoliating Facial Scrub. Like I said earlier, I like my facial scrub quite invigorating and for the little bits to be quite big to really get the dirt out, as my skin's sensitivity is normal. So as soon as I read 'Super Fine' and that it contained Evening Primrose, which is perfect for soothing, I thought that it would probably be more suitable for sensitive skin. However, when I tried it, I have to say I really liked it. Yes the crushed walnut shells and cocoa powder particles are very small, but it still leaves my skin feeling clean, fresh and smooth. Furthermore, because it is so gentle, it just means I can use it more often! I actually found myself using it three times a week, whereas I usually only exfoliate twice a week. Again the smell is lovely and that traditional cocoa butter formula definitely shines through. You can pick it up here for £5.49. Overall I have to say I am impressed at the quality and ingredients within these products and at such a decent price. I now have my eye on other Palmer's products and definitely want to try some from their Coconut Oil Formula range, especially the hair care for curly locks! Have you tried anything from the Palmer's range? What's your go to skincare at the moment? *PR Gift. All opinions are my own. 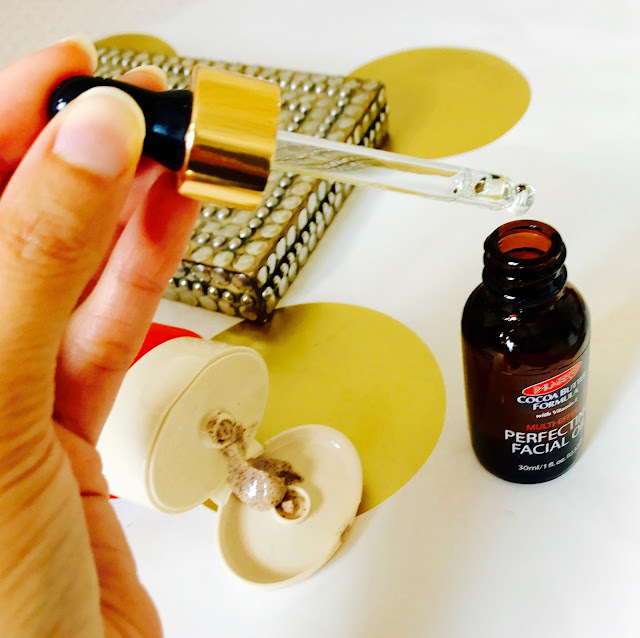 I have been using the perfecting facial oil recently, and I really like it! It is light and non-greasy, and also contains retinol as well as rosehip. I wish more of the products would launch in South Africa though! I've never heard of this brand! I need to check it out!! You made me check this out. Definitely on the list. I've never used palmers before but I'll definitely be picking some up after this post! These sound amazing! I'll have to look into getting palmers products in the future. This made me want to check it out! I have been looking for a good facial scrub, but my skin is a bit funny! Sometimes it's sensitive and sometimes it's not. I don't think I've ever had a problem with Palmer's products so I think I'll check the facial scrub out! I have to admit that I haven't tried any of Palmer's products before but after reading this I'm certainly going to pick some up! Ive been hesitant about trying this product because persons complained about the greasy feeling after. I have oily skin so I try to stay away from any extra grease but I may tey it though to have my own opinions. Enjoyed reading this post! I've used Palmer's Cocoa Butter Formula in the past and i love it! The facial oil sounds great especially for the price of it, i will have to check it out! How to get the perfect base! Hair Transformation with Hazel & Haydn!